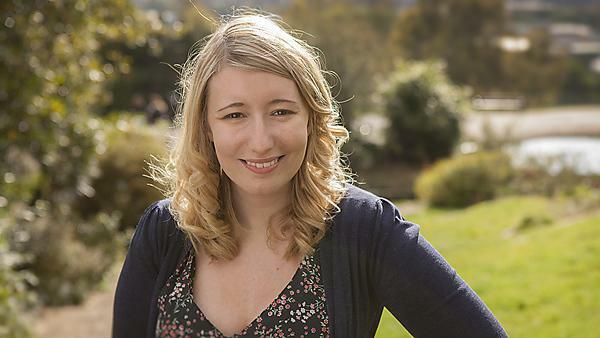 Emily Miller explains how studying at Plymouth University provided her with the necessary foundations to forge a successful career in the arts. After graduating I seized every opportunity to take part in any filming, both behind and in front of the camera. I was very fortunate to get a part in a children’s TV show for ITV amongst some other really fun and challenging roles. Alongside this I started my own production company working as a writer and director and I am now lucky enough to work at the BBC developing new television ideas every day. The biggest change has been from wanting to work in front of the camera to loving working behind the camera as well. The trickiest thing I’ve found, and that I think a lot of people in the arts find, is trying to explain to other people what it is you do. You must have confidence in yourself and what you are doing. Working on ITV’s Bottom Knocker Street – a mad, colourful children’s TV show – I got to dress up as a granny and it was great fun to film. Have persistence and enthusiasm – people who work in TV are really busy so might not get back to you right away, don’t be discouraged – persevere and you’ll get there eventually. There are so many – but getting to try new performance styles like clowning and developing our own final performance (in which we built a boat and a bathtub on stage) will always stay with me. For more information about studying dance theatre, please visit our BA (Hons) Theatre and Performance and MA Performance Training pages. For more information about our range of courses within the School of Humanities and Performing Arts, please visit the school page.